Thanks to everyone that came out for last Sunday’s group bike ride to the Mosaic District! The event drew a crowd of 10 riders and had near-perfect weather under blue skies and mid-50’s temperature. The group met at 9:00 AM for coffee and breakfast outside of the VITA apartments on Tysons One Place. 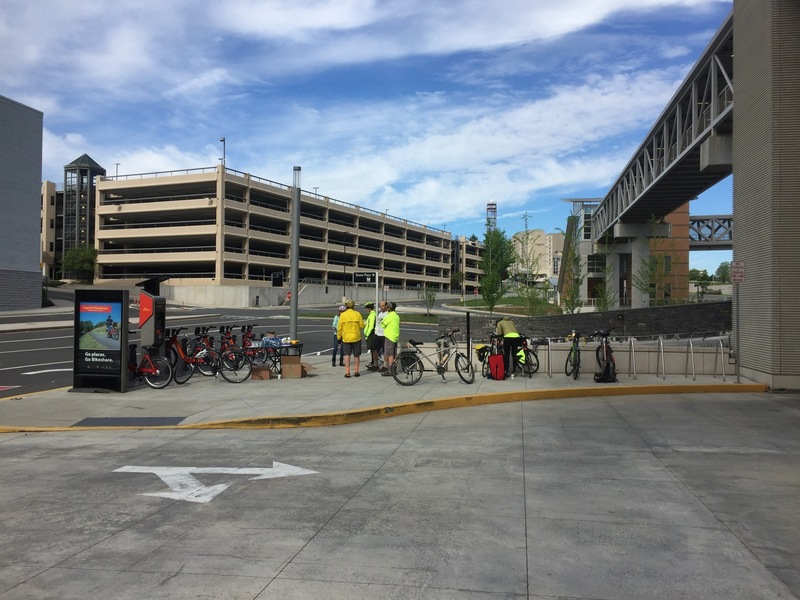 The ride started from Tysons One Place and continued to Kidwell Drive, which the group took to cross Route 7 and connect with Gallows Road. From there, they followed Gallows Road for two miles to Avenir Place, and then cut through to meet Merrilee Drive. From Merrilee it was a straight shot into the Mosaic District, where the weekly farmer’s market was already underway. The ride there clocked in at about 20 minutes, and everyone enjoyed the farmer’s market for half an hour before turning around and heading back to Tysons Corner Center at 10:30. Upon the return, riders were treated to free bike locks, bike lights, ear buds and Capital Bikeshare passes to cap a successful group bike ride. Special thanks to FABB for leading and assisting in coordination, as well as VITA, Nestle Toll House, Mosaic Green Commute, and Tysons Corner Center. Bike to Work Day is May 19th! Come meet up with us at the Tysons Pit Stop at 1861 International Drive, in front of the Capital Grille building for refreshments and giveaways. Register here, www.biketoworkmetrodc.org. Don’t miss out on future group rides and biking events in Tysons! Visit FABB’s page www.fabb-bikes.org and register for the next great event.